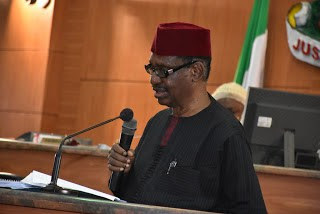 The Chairman of the Presidential Advisory Committee Against Corruption, Prof. Itse Sagay (SAN), has revealed that he earns N200,000 per month as salary. A lot of Nigerians had been eagerly awaiting the release of the looters’ list as promised by the Federal Government, but were disappointed when it was finally released last Friday and Sunday; they said there was nothing new about it as it contains the names of people they were already familiar with. What happened? Well, you cannot go and cook up a list just to satisfy the people’s appetite. If the list contains the names of people who are being prosecuted or interrogated right now, that’s the best; that’s the only list that can come out and, of course, another group that will be named would be people whose assets have been forfeited, either temporarily or permanently. I don’t really understand what Nigerians expected. Yes, we knew all these names before and because they had been charged to court, the public had heard about them before. What else could the list be other than those who had been mentioned in the past? What was particularly shocking to many Nigerians was that the list didn’t include the names of former members of the Peoples Democratic Party who are now in the ruling All Progressives Congress and who in time past were also accused of looting public funds, prompting a former aide to ex-President Goodluck Jonathan, Reno Omokri, to release his own looters’ list. Why were these people’s names omitted? It is good that Omokri released his own list; it is encouraging and this is what I have been telling Nigerians; if you think the list is incomplete, go and bring what you have. Let everyone bring out their own list. People who have not said anything but know more should bring their own lists out. That’s good for the health of the country and, of course, while you are bringing out your list and you mention a name that has not been involved in corruption, then there is a risk of defamation and liability. Let people come out and publish their own lists. Anyone who is not satisfied with the government’s list and thinks some names were omitted should publish their own. That’s very healthy for our democracy. So, you agree to the names on Omokri’s looters’ list? No, I don’t agree to those names; I’m only agreeing to the idea that you can bring out your own list. There is a difference between the two. I don’t know where he got the names on his list from and that is his own problem. I don’t confirm the names on his list. I can’t guarantee his list, but what I’m saying is that he has the right as a citizen to express himself; it’s a natural right and if he has further information, he can bring it out. But any list is subject to libel if somebody’s name is falsely mentioned. But if everybody starts bringing up their own list, wouldn’t there be confusion, especially because it is the government’s job to have captured every looter in its list in the first place? As I said earlier, the government has done its own and I cannot swear that some people were not left out. But if for any reason some people were left out, as Omokri has done, let people bring up those names and if the list is correct, the people therein will keep quiet, but if they are innocent, they will sue whoever brings out their names. That’s the way I feel; I don’t think the government should be compelled by the people who are saying, ‘Bring out this name, bring out that name.’ I don’t agree. Whatever list the government has released is the official list of looters. In essence, you agree that the government’s list is floppy? Nothing is ever perfect and I’m not even saying it’s not a complete list. I repeat, if anyone feels it is not a complete list, let them add their own. You cannot compel the government to put so-and-so name; it has its criteria for determining who should be on the list. Let the people add their own names so that we can have a complete list. The government’s looters’ list contained mostly people from the opposition, the PDP. Does it mean the members of the APC are all saints? What it means is that the PDP, which had been in power since 1999, had had access to our assets, our national wealth and had helped itself without restraint, without caring about the welfare of the people. Others didn’t have that opportunity, so ideally, their names would be the ones being mentioned. Maybe in 10 years’ time, maybe some APC members would have their names mentioned in the looters’ list. I am not surprised that the list contains mostly the PDP members because they were the ones in charge of our common wealth before the APC came in. APC wasn’t the party in charge of our common wealth before. But what now happens to those who defected from the PDP and are now in the APC? For instance, a former Minister of State for Defence, Senator Musiliu Obanikoro, who left the PDP for the APC, was alleged to have been involved in the same $2.1bn arms scam that made most PDP members to be on the looters’ list. Why was his name omitted? I have no idea. You know this is a list released by the Minister of Information [Lai Mohammed]. So, he must have a reason for omitting his name. Maybe there has been a change of situation as regards his charges at that time. I have no idea. But, I still insist that anyone who has a good reason to include a name should put the name. Those who feel that Senator Obanikoro should be in that list should come out and say so. And if he’s actually among those people, there is nothing we can do about it. You are the chairman of the Presidential Advisory Committee Against Corruption. Did you advise the government properly before it released the list? We have nothing to advise. Those who compiled the list are the anti-corruption agencies: the Economic and Financial Crimes Commission; the Independent Corrupt Practices and Other Related Offences Commission; and possibly the Code of Conduct Bureau. Those are the people who have investigated and put on trial the people mentioned in the list. We don’t deal directly with issues like that at all. We are more of a think tank, providing guidance, coordination and capacity building for the anti-corruption agencies. If an agency needs information from another, we help to coordinate. We also propose laws that can help to improve the chances of achieving either the successful prosecution of looters or the successful recovery of property from them. We do a lot more, but we are not directly in charge of looters. For instance, if I want to know more on a looter, I will still have to call the agencies and request information and they will give me. But when President Muhammadu Buhari set up your committee, the impression was that you would be appropriately advising the government on corruption issues. Why were you kept in the dark as regards the looters’ list? We don’t have detectives; we don’t have prosecutors. It is the anti-corruption agencies that have all these. They have forensic laboratories, so they are the ones in charge. Our committee’s job is different and we don’t deal with the day-to-day issues of corruption. We deal with ideas and capacity building. For example, people send petitions to us, but we don’t deal with that. However, when it became persistent, we had to create a section for that, but once we go through the petitions, we still have to send them to the appropriate agencies. As a Senior Advocate of Nigeria, is there not an illegality in the action of the government in publishing the names of people yet to be convicted of corruption? You would appreciate the fact that the government didn’t voluntarily release the list. It was done due to the compulsion of a Federal High Court in Lagos based on an application by the Socio-Economic Rights and Accountability Project. When the government didn’t release the list in time, they said they were disobeying court order. Now that we’ve released the list, they are saying we are breaching some rules. So, it’s a very difficult situation and I think it’s good for the government to obey court order, which is what it has done. If the government had done that, people would have still not been satisfied. They would be asking, ‘What of so-and-so?’ Nigerians are so difficult to satisfy, very difficult to satisfy. The logic is that the person under trial has been arrested because there is evidence that he’s a looter, so his name should be mentioned. The state is convinced, it has evidence and it is prosecuting. In 2016, the Federal Government told Nigerians that 55 persons looted N1.34tn under the Jonathan regime. Is that another list to be expected by Nigerians or have their names been mentioned in the current looters’ list? I don’t think so. That list includes former governors, ministers, bankers and so on. That is another list entirely. Is the government going to publish their names? Yes, I’m sure. In fact, there is a paper containing all their names, the charges against them, how far their cases have gone. Some of them have never been charged. Who are those on that particular list? No, I don’t want to mention any names for now. There are people in that list that the court declared that the EFCC had no right to prosecute for technical reasons, not for substantive reasons. The feeling by some Nigerians is that if you are in the APC, you are not corrupt. So, if the PDP members whose names appear on the current looters’ list defect to the APC today, will their names be removed? I pray and hope that will not happen because that will affect the confidence people have in the APC. I don’t think the party you belong to should count when the government is releasing a looters’ list. There should be no distinction. But there has been a distinction, which is why Nigerians are questioning the whole anti-corruption war. The citizens are expecting an anti-graft war that doesn’t differentiate between the PDP and APC members, so why is it that the government doesn’t give a damn about people’s expectations? I don’t know, but maybe you should speak to the Minister of Information. But if you look at it, what I heard is that the PDP actually challenged the government — in addition to the court order, though — to produce a list of their members who were involved in looting. And the government obliged them. So they can’t complain in that sense. But I agree with you, that if the government is going to produce a looters’ list, it should be a full list, including people who are hiding in the APC right now. Personally, I frown very strongly at defection from one party to another when a party has problems. I have no respect for people who do that and I don’t see why they should be protected. I’m not saying anyone is being protected, but they should not be protected. What do you make of the PDP’s response that their ex-members now in the APC helped Buhari fund his electioneering in 2015? The PDP should be more specific. I’m not aware of their former members that funded Buhari’s election. Agreed, some PDP members defected to the APC, hence, if anyone has information regarding them, let them come out. But I don’t think what they alleged happened. I think the APC raised its own election funds itself. Talking about anti-corruption fight, in May 2016, former President Olusegun Obasanjo said that when he fought corruption and recovered over $1.25bn and £100m from the Abacha loot, his government didn’t make much noise about it. He suggested that there was too much noise surrounding President Buhari’s anti-corruption war. Do you agree? I don’t agree with him. Noise should be made because you cannot reduce us to this level of poverty and wretchedness and think the government will continue to hide your name from the public. Even if a person has yet to be convicted, let them be subjected to the odium of public contempt so that when you see his child driving a Rolls Royce, you should be able to point at him and say, ‘That’s a car bought with our stolen treasury that you are driving.’ I support media trial; let the looters be tried in the press. If they feel there is anything wrong with it, let them sue the government; they have the right to sue if they didn’t steal. But if they are eventually found to be innocent, what happens to their reputation that is already soiled due to the media trial? Why is it difficult for the APC government to prosecute its members who have been found to be corrupt? For instance, what’s the fate of a former Secretary to the Government of the Federation, Babachir Lawal, said to have embezzled N200m belonging to the Internally Displaced Persons in the North-East? Well, I know about that case. Some actions have been taken; the man has been removed from office. I heard there’s a directive that he should be further investigated for possible prosecution. I cannot say precisely what stage the prosecution is right now. We can only wait and see what further steps will be taken and if not, what reason is there for an inaction. Some experts believe that fighting corruption shouldn’t translate to making the people go hungry. What’s your take? It’s a sign of ignorance and immaturity. Before the APC came in, oil was being sold at over $100 and the quantity the country was producing was over 2.5 million barrels per day. By the time the APC came in, the oil price crashed to about $30 and oil production reduced to about 1.1m bpd. Apart from that, all that the country had earned had been looted by the PDP. Virtually everything! If you were at the 10th Bola Tinubu Colloquium, you would be shocked by the revelations of the amount of money the PDP spent in its last two weeks on nothing that could be ascertained. Before they left power, they carried out massive looting. We’re talking about hundreds and millions of dollars and billions of naira. So, this country had been bled dry; there was nothing. This government had to start from zero to build something gradually. Everybody acknowledges that the citizens are hungry, but there’s no way that hunger can be eliminated immediately; it will be gradual. The PDP people were blowing our money until the treasury was going empty and they didn’t care. This government has just started building our reserves and over $40bn has been built. This government has also been trying to provide a fair standard of living to the vulnerable people in our society. The APC government keeps saying that oil price fall was responsible for the recession. But, during the Obasanjo regime [1999-2003], oil prices hovered between $24 and $75, yet the country wasn’t plunged into a recession. Would you agree that economic policies, rather than oil prices, have been largely responsible for the current economic problem? There was virtually full production during Obasanjo’s regime; the country was producing around 2.2m bpd. Don’t forget that we still rely heavily on oil for our survival, so if anything happens to the output, it will tell on the economy. Like I said, output was around 1.1m bpd when Buhari came in, though now I think the situation is improving gradually. Therefore, you cannot compare the two situations. The country is even lucky that it was the APC that came in in 2015. The country would have been bankrupt. If the PDP had returned to power, the economy would have come to a standstill. You needed to see what the account was; they were not planning to invest; they were not thinking about the future; they had access to the money and they were just blowing it. But, some of the same set of people who supposedly ran our economy aground are also in the APC. So, what difference does it make? I’m not going to say much about this. But, from what I observed, the problem of the APC is the PDP members who defected to it. They brought their DNA into the APC. They are the ones who want to loot. If you look at the National Assembly, talking about all these things going wrong, they are the handiwork of the PDP elements who came in. They are the ones destabilising the APC, they are the ones involved in looting, they are a great drawback to the progress of this country. The APC will do much better if those PDP elements go back to where they came from. If the APC feels that way, why can’t they expel the ex-PDP members from their midst? This is why I criticised the APC leadership a few months ago, that there were some PDP elements within the party who were wrecking it, these people are uncontrollably corrupt and at the same time organising power centres to oppose President Buhari. I said the APC should have dealt with those PDP elements because they came into power with gross indiscipline, contrary to the laid-down procedures of the APC. I still stand by my point that the presence of those PDP elements is very unhealthy for the APC. President Buhari and Vice President Yemi Osinbajo have kept on lamenting the 16 years’ ‘misrule’ of the PDP. Aren’t they supposed to just keep working without complaining? No! Nigerians have short memory, we’ll keep on repeating it! We’ll keep on repeating it! Nigerians will keep complaining that they are hungry, but they won’t link it to the horror they were put through because of the PDP’s mismanagement. We have to keep on repeating it so that Nigerians will stop talking loosely about this government’s actions and inaction. Nigerians have short memory, so we need to keep on reminding them. We need to keep shaming those people who looted public treasury and the citizens need to know who the source of their problem are. Of course, work is going on. The business environment is getting better; prospective investors are now getting visas at our airport here; there is a centre where you can register your business and get the paperwork immediately. In fact, there is a Special Adviser to the Vice President to run this aspect of the government. A lot has changed. Nigerians can go to sleep and be assured that every kobo the government makes is being put to good use for the benefit of the citizens and not being shared. Nobody is sharing any money again — but perhaps at the National Assembly looting is still ongoing due to budget padding. Some sharing may be going on at that level, but at the executive level, I can assure you that no sharing is going on. Remember, we have the Treasury Single Account, though initiated by the Jonathan administration, but never implemented. The TSA has revealed the trillions of naira that this country had been making but which nobody knew about. They can stand the heat, but that doesn’t mean they don’t have to respond. I can’t say because I want to stand the heat, if you give misrepresentation or falsehood or fake news about me, I shouldn’t respond. In fact, this government is standing a great heat, they are doing a great job with lean resources. They can stand the heat, though not the heat the people are giving them out of malice or hatred or because they are beneficiaries of corruption. Talking about the 16 years of PDP’s ‘misrule’ that the APC has always complained about; instead of persistent lamentation, why can’t the Federal Government prosecute former Presidents Obasanjo and Jonathan, who were the leaders at the time, if so much looting was carried out under their regimes? Speaking from a peripheral level, unlike in South Africa, Brazil, and other countries, we don’t have a history or culture in this country of prosecuting our former presidents. It will take a long time, when we’ve developed and become more mature, to do that kind of thing. Right now, if you touch a former president, the storm that it will bring will be so diversionary and disturbing that it will affect your capacity to do positive things for the citizens. In my own thinking, you have to leave them alone and go for those who carried out the act of looting. That means we shouldn’t expect much change in our society then. There is a radical change in the government right now, but talking about the arrest of former presidents, I don’t think we are ripe for it. There will be too many sentiments; people will threaten to carry arms to defend their ‘son’. Nigeria is not an easy country. One must step as if one is on eggshell; do what you can do now, and suspend what you can’t do now because of our immature culture. Maybe this will change in the future. Recently, you threatened to release the running cost of the National Assembly leaders; when are you going to release it, and is it different from the N13.5m per senator figure that is already in the public domain? Totally different! It is far above the N13.5m monthly running cost you are aware of. The only thing is that I have not yet got a hard and conclusive fact. The information I am getting informally is that the NASS leaders are earning between N800m and N1bn as running cost every year. I don’t have concrete information yet, but from a very reliable source, that’s what I’m hearing. Once I have the concrete evidence, I will release it. What are the running costs incurred by President Buhari and Vice President Osinbajo? I can confirm to you that the two are earning just their basic salaries, around N1.7m per month for the President and a little less for the Vice President. Anything else that is voted for their offices doesn’t go into their accounts. They don’t see the money. That’s the difference between them and the lawmakers. In the National Assembly, these people are handling cash. In the spirit of anti-corruption fight, some Nigerians are also asking that you disclose your earning as the PACAC chairman. As the PACAC chairman, I earn N200,000 per month, while the four other members of the committee earn N160,000 per month. Is President Buhari contesting in 2019? I hope so, I pray so. He hasn’t announced, but he’s the best candidate for presidency in this country. Out of a country of 180 million people? Yes. If you can mention another person who is better, I will be glad to hear so that we can think of him too.